Julie was over again on Monday night, and as usual we were chatting (gossiping) and sipping gin & tonics (with lemon, not lime - thanks Uncle Roger!) as this has become our new ritual. The kids sat happily on the sofa nearby, transfixed by the latest installment of WordGirl. Their little bodies exhausted from playing at the splash park all day and boycotting their naps. Our CSA share from Small City Farm last week included a ton of delicious sweet peppers and onions, in addition to the most amazing tomatoes, okra, herbs, apples, and eggplant we've ever had. So with the abundance of peppers and onions in my fridge, what better to make than vegetarian Philly cheese steak sandwiches?! While Julie and Josh got the kiddos in bed I caramelized the onions, which doesn't take but 15 minutes, and then finished up the rest. This was such an easy dish to make - such a great go-to weeknight dish, and not nearly as fatty as the real deal version. Definitely will be making this again soon! Preheat the oven to broil on high. Move the oven rack down to the lowest slot. In a medium saute pan caramelize the onions in about a teaspoon or two of olive oil. This takes about 15 of cooking over medium high heat, frequently stirring so the onions don't burn. When they become translucent and a light brown color you'll know they're about perfect. Once the onions are slightly browned, add the minced garlic and the sliced peppers. Cook for another 5 minutes or so. Then add the package of "beef" tips, Worcestershire sauce, and soy sauce and cook 7 minutes (or as long as your package directions suggest). On a cookie sheet greased with a little butter or olive oil spray, put 4 separate piles of the onion/pepper/beef tip mixture. Top each pile with a slice of provolone cheese. Place in the preheated oven for about 2 minutes, or until the cheese is nice and melted and bubbly-looking. On a greased up grill pan, place the sliced sandwich rolls or buns face down to warm them up and give them a slightly crispy edge. This should only take a couple of minutes. Then fill each bun with one of the sections of provolone topped Philly cheese steak goodness, topping each with greens. Enjoy! Josh and I make pretty a strong effort to stick to a plant-based, whole food diet as best as we can. Lately we've been slacking a bit on this. We've been diligent about sticking to a vegetarian diet, but sometimes the plant-based (i.e. - vegan) part is tough. It gets crazy around here at times, and we end up grabbing vegetarian pizza or Chinese take-out instead of cooking a healthy nourishing meal. This is why I wanted to create an easy to cook, hearty, and satisfying dish that felt like a "vegan cheating" meal, even though it's not. The true "cheat" lies in cashew cream, which has a thick consistency like whole milk. It also packs a ton of flavor. I learned all about how to make cashew cream and cashew cheese in Tal Ronnen's fantastic cookbook called The Conscious Cook. I would highly recommend this book to anyone who has an interest in vegetarian and vegan cooking, especially beginners! The book is packed with advice for substituting plant based foods for animal ones. A few of the recipes can be a bit intimidating and require obscure ingredients (especially if you're new to vegan cooking), but I found the majority to be straightforward and, of course, delicious! This recipe is not very complicated, but you have to complete it in two parts with a long wait time in between. The night before you eat it, you must soak the cashews in water to get them ready to make into cream. The next day, you prepare the dish for baking, and then, you guessed it - bake it. If you plan ahead, it's not really hard. I like to make it on the weekends and even freeze this dish to bake later (for when it gets really busy around our house). Vegan Scalloped Potatoes would also be a yummy vegan addition to your holiday spread. Serve this with a fresh seasonal salad and you're set! Hope you enjoy it! 2 TBS vegan grated Parmesan "cheese"
* nutritional yeast can be found in the bulk foods area in many grocery stores. It is not the same as active yeast that's used in making bread dough. Preheat oven 375 degrees. Wash potatoes and cut off any funky looking bumps or spots. Slice potatoes to about 1/4 inch thickness. Grease a 7 x 9 inch casserole pan (or a pan of similar size). Layer the sliced potatoes in the greased pan. Heat a saute pan over medium heat and add the vegan butter and onions. Cook for 5-7 minutes and add the garlic, cooking 2 minutes more. In a large mixing bowl add the cashew cream, sauteed garlic and onion, nutritional yeast, fresh rosemary and thyme, and ground cayenne, a dash of salt, and a squeeze of fresh lemon juice and give it a good stir. Pour this mixture over the sliced potatoes in the casserole dish. Top with Panko bread crumbs and vegan parm. Bake for 45 minutes, broil on high for 1-2 minutes at the end to give the dish and nice browning. Enjoy! Soak 1 cup of raw whole cashews overnight, or at least for a few hours. Place soaked cashews and whatever water they've been soaking in into a high powered blender like a Vitamix or Ninja. Fill with additional water until the fill line reaches 2 cups. Blend on high for a minute or two. That's it! You've got cashew cheese! A couple of weekends ago, the kids, Josh, and I shopped our local farmers market for the first time in a long while. Although fewer than normal vendors were present, there was still a lot of delicious, fresh produce available. This was a very good sign, especially since it will not be long before some great produce comes into season. Our greatest score of the trip was, without a doubt, the enormous bag of collard greens we bought. We almost felt like we were stealing. For a very small price, we came away with greens that likely weighed more than our nearly 2 year old daughter. The kicker was they cost only $3.50! Do you see the giant phone book bag he's putting the collard greens into? It was barely sufficient. This farmer also carried some potatoes, so we obliged to purchase a few. Like the collards and most other items we've purchased from the farmer's market, we came away with high quality loot at a fraction of grocery store prices. They did make an excellent Crockpot potato and collard soup! After returning home, we stripped the leaves from the stems and gave the greens a good bath. This effort is completely worth the upgrade in quality, freshness, and price. We've noticed in the past that vegetables like these somehow last two weeks longer in our fridge (if they do) compared to what we buy at any store. After washing, we started to think about how we would prepare the zillion pounds of collard greens this week. Like the rest of the US, we're still weathering the cold. Not to mention I am not a huge fan of cold weather, especially when it stretches this far into March. Plus, if you read this blog you know I love soups and stews, so I knew that would be the fate for at least some of the greens. So, let's get to it, and make some delicious and satisfying Crockpot potato and collard soup. Before I forget, thank you to my pal Emily McLaren for your help with Crockpot cooking times for the lentils! *You could use another type of lentil here, but the cooking time may be different than if you use red lentils, which I've found require a bit less time to cook than other varieties. Heat the olive oil over medium heat in a saute pan. Add the onion and garlic and cook for a few minutes until the onion is slightly translucent and the garlic and onion are fragrant. To your Crockpot add the sauteed onion and garlic, collards, potatoes, mushrooms, veggie broth, water, fresh thyme and Thai bird chilies (OR the red chili flakes) - everything EXCEPT the lentils. Turn heat to high and cover. Let it cook for about 4 hours, then add lentils, one more cup of water, and cook for another 45 minutes or so. Top with grated Parmesan (vegan parm works great if you want to keep this a vegan meal!). Enjoy! Josh's note: I'm a big fan of Lawry's seasoned salt, and it goes well with this soup and others on this site. My 4 year old son Ben loves to play hide and seek. As a matter of fact, we played hide and seek while I prepared this soup. However, he hasn't quite grasped the concept of hiding yet. But, he makes up for his lack in hiding skills with enthusiasm for the game. When it's his turn to go hide, he runs down the hall squealing with laughter. He'll yell, "OKAY FIND ME!!!" Of course this totally gives away his hiding spot. He gets so tickled when he hears my feet walking through the house, pretending to look for him. "Where are you?!" I call out. At this point, he can't even contain his giggles. I usually find him standing in the center of his room, the world's biggest grin on his face. "You found me!" I love recipes like this spicy vegan minestrone. It's dependable, and it requires only partial attention. Thus, I can concentrate more heavily on hide and seek. To be honest, on days that feel longer than others, this is all I really want to do as the day draws to an end. I love how this does not require a ton of energy or effort - I can almost make it in my sleep. It is super easy. As much as I love cooking, I have those days where I would rather play with my kids, talk to Josh, catch up with friends, etc. Additionally, this recipe makes a TON of soup, it freezes really well, and it's great for a crowd too. It hits all the checkboxes - it's fresh, quick, easy, abundant (in quantity), and pleasing to all crowds. This is also a pretty versatile recipe. You can play with the ingredients and not risk losing any flavor. In fact, adding seasonal, fresh vegetables to the soup would add some nice, complementary dimensions of flavor to it. For example, I imagine okra would work well in this. This is a soup for all seasons that can adapt to vegetables, herbs, spices, and flavors that are in season. *Dried red Thai Bird chilies can be found in the international foods section of most grocery stores and some farmers markets. They pack a spicy punch. Don't leave them out. **An easy way to make this soup gluten-free is to use a gluten-free pasta here. There are tons of great options available these days. Just make sure not to overcook your gluten-free pasta. Some of those brown rice pastas can get pretty mushy if you overcook them even just ever so slightly. Ok! On with the recipe. In a large soup pot heat the EVOO on medium heat. Add the onions to the hot pan and cook for 5-10 minutes, then add in the garlic and cook for a few minutes more. Don't you love the way onion and garlic smell after they've cooked for a few minutes in a hot pan?! One of my favorites! Ok, now add the carrots and celery and cook for another 3 minutes, stirring frequently. Next add to your pot the veggie broth, tomatoes, black eyed peas, cannellini beans, sliced mushrooms, fresh thyme, oregano, and red Thai bird chilies. Give the pot a good stir, turn down the heat and let it simmer for about 15-20 minutes. While the soup is simmering bring a separate pot of water to boil. Cook the pasta in salted water for about 3-4 minutes less than the package directions. You don't want the pasta to be fully cooked, otherwise it will be mushy in your minestrone. Make sure to reserve at least a cup or more of pasta water to add back to the soup! Don't forget this step (If you do forget to keep some of the pasta water, as I have many times, don't worry. You can just add water with a little salt). Now drain the pasta and add it back to the simmering soup. Also pour 1/3-1 cup of pasta water back into the pot of minestrone, depending on how thick you want it. Simmer for at least another minute or two. Lastly, squeeze half a lemon into the soup. Taste it. Revel in your culinary achievement (yes I do consider something as simple as soup to be a culinary achievement! Especially soup this tasty). Then determine if you need to add the other half of the lemon juice and or more salt. Enjoy! 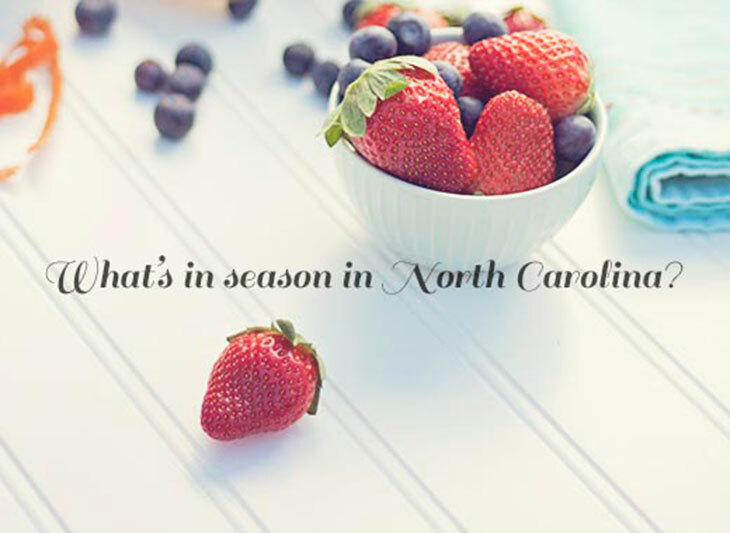 what's in season in north carolina in march? Looking out the window, you would never know that it is March in the Southern US right now. As I type this, I'm watching snowflakes stick to my frozen pink camellia blooms. My kids are glued to the windows, captivated by the falling flurries of snow. Their maple syrup covered hand prints cloud the glass. Waffles for breakfast leaves its mark. Ahhh...but it is March, and I'm looking ahead to what I'm going to cook and eat this month. Spring is just around the corner. That means I should find some great new local produce at the farmer's market soon. I've complied a short list of the freshest produce according to the NC Department of Agriculture and the 10% Campaign. What's in season is going to vary depending on where you live, obviously. If you don't live in NC and want to know what's in season around you, I would suggest a simple Google search. Or, a visit to your state's Department of Agriculture website should do the trick. This is in no way a comprehensive list. It's just a rough guide of produce you can expect to see more of at your local markets and grocery stores, specifically what's in season in North Carolina in March. I find it tremendously helpful to have an idea of what is currently in season to help with planning our meals. Plus, produce that is in season is fresher, tastier, more nutritious, and cheaper! It's a win-win all around. Some seasonal recipes I'm thinking we'll try this month are these Quinoa and Kale patties (using bok choy in place of kale) from Yummy Supper, a vegetarian version of this Shepard's Pie with rutabaga courtesy of Martha, this Tofu and Bok Choy Stir-fry from Epicurious, my Superhero Smoothie, and an amazing Vegan Minestrone soup. Those last two recipes I'll be sharing this week on the blog. What are some ideas y'all have for dishes to make incorporating the seasonal ingredients above?